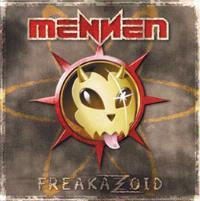 Freakazoid is the fifth album from Swedish band Mennen. While they are well known in Europe and Japan, this might be the first time many music fans in America have heard of the group. They were formed in 1994 when Joss Mennen (hence the name) left the band Zinatra. He set out to create a musical style that was more metal oriented than the melodic hard rock that was the mainstay of that outfit. With Freakazoid the group has created an intriguing mix of material. While much of it is definitely heavy metal, the flavorings are all over the musical map. One can pick up at least slight nods to the sounds of such diverse artists as Duran Duran, Asia, The Police, Rush, Queensryche and The Cure. The end result is a sound that is all Mennen. While some of these songs suffer from sounding too much like the rest of the material, this is still a very listenable and potent disc. There is a certain awkwardness to some of the material, otherwise this would be very mainstream and almost pop oriented in its delivery. Overall, this is a good, but not great release. This comes in with an '80's metal texture. As it carries forward, though, it feels a bit like Queensryche. The verse has a Duran Duran goes metallic feel to it, but the choruses return to the '80's metal approach with a bit of a prog metal feel. The break has more of that prog metal flavor. Starting as a rock ballad, this texture, feeling a little like Asia, makes up the mode here. The vocal arrangement on this is pretty impressive. This feels a little like Rush, but with a more pop rock sensibility. It also has just a slight Police texture on the verses. The choruses are more prog metal oriented. This explodes out into a very tasty guitar solo segment with non lyrical vocals over top for the most effective and powerful segment of the disc thus far. As the chorus comes out of this it's in a more powerful vein. "Rain" is darker and more meaty than anything thus far. It's an off kilter prog metal excursion that has a great texture and some killer changes. This highly dynamic one really rocks out and is definitely stand out. This is an anthemic and highly effective prog metal number that really works wall. The arrangement is very powerful and expansive. This is a killer. No, not a guy's name, the title here stands for Band of Brothers, and this cut is a crunchy pretty straightforward metal stomper that is a little generic, but quite testy. The title track is more stripped down and pop oriented, but still rather cool. On the one hand, this feels more prog than a lot of the other stuff, yet it also includes some rap like vocals. This one really has a very effective arrangement and works pretty well. This one is a lot more laid back - another prog metal (emphasis on prog) track, this time a ballad. It turns to more '80's arena rock territory later. 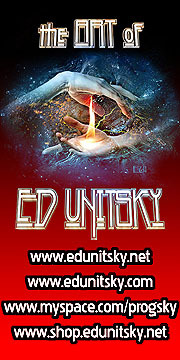 This is rock hard prog metal with some killer riffs, changes and textures. It's thus far the strongest cut on the disc and is very dynamic. The first of the three bonus cuts, this is a pretty acoustic driven ballad. It is fairly dynamic in its arrangement and gets heavy and electrified later. This is another very strong composition. Another fast one, this one combines the sound of bands like The Cure with prog metal. It's quite unique and very cool, and has some great sounds. This is another winner. It even drops to an almost funky stripped down section with an awesome groove. Another solid prog metal jam, this includes some killer soloing. It's just not as strong as the last couple tracks.